Why does this stevia contain a blend of other ingredients? Pure stevia extract is naturally bitter, potent, and cannot be eaten by itself. To help ensure the best taste for your sweetening needs, this stevia, like all other brands of stevia, is processed with a blend of stevia and other ingredients. Two common ingredients are dextrose and maltodextrin, which are carbohydrates derived from corn. Though dextrose and maltodextrin will not take away from the sweet taste of stevia, they will work to dilute the potency of the stevia leaf extract and make your stevia product more measurable for consumer use when substituting “cup-for-cup” as a sugar replacement. 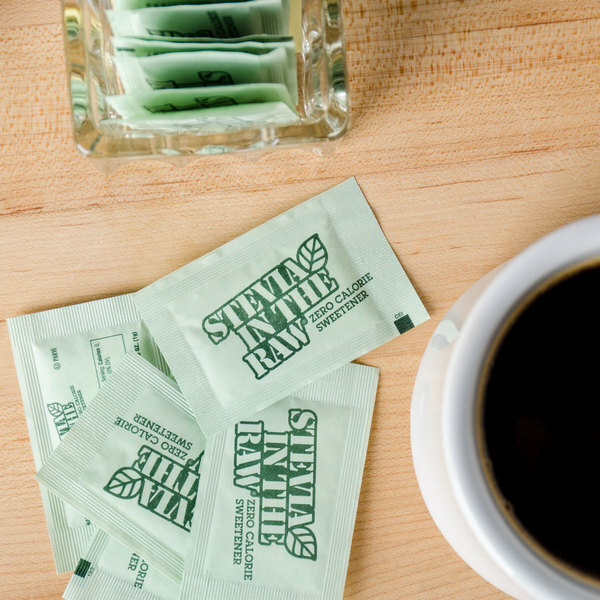 Looking to expand your restaurant or cafe's selection of sugar and sweetener packets? Stevia In The Raw is an all-natural sweetener made from the South American stevia leaf that will please your patrons with a preference to all-natural products. It has a sweet, refreshing taste without the calories or carbohydrates. In addition, this sweetener contains no preservatives, no fillers, or other ingredients. Since it contains no allergens, it is an excellent choice for diabetic or carb-conscious patrons and others with dietary restrictions. Stevia In The Raw is commonly used to sweeten coffees and teas, though it can also be sprinkled on breakfast cereals or fresh fruit. Offer these convenient, pre-packaged 1 gram packets on your tabletop in a caddy. They're also great for parties or catered events so your guests can sweeten their hot beverages as they please. 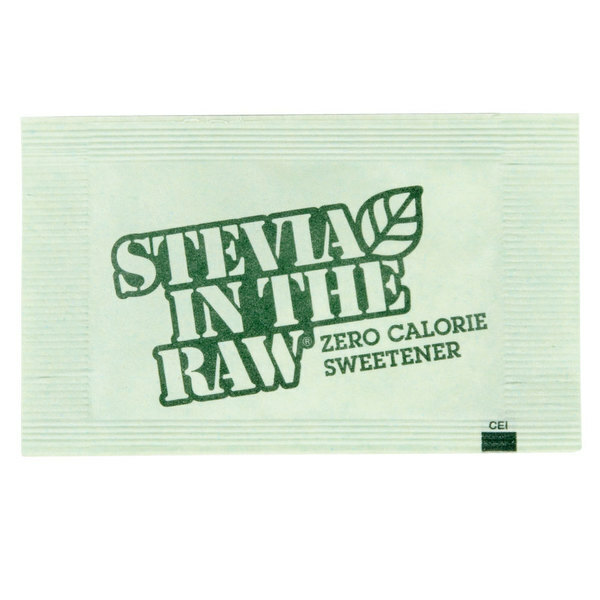 A health-conscious alternative to standard sugar, each packet of Stevia In The Raw sweetener provides a simply sweet taste. 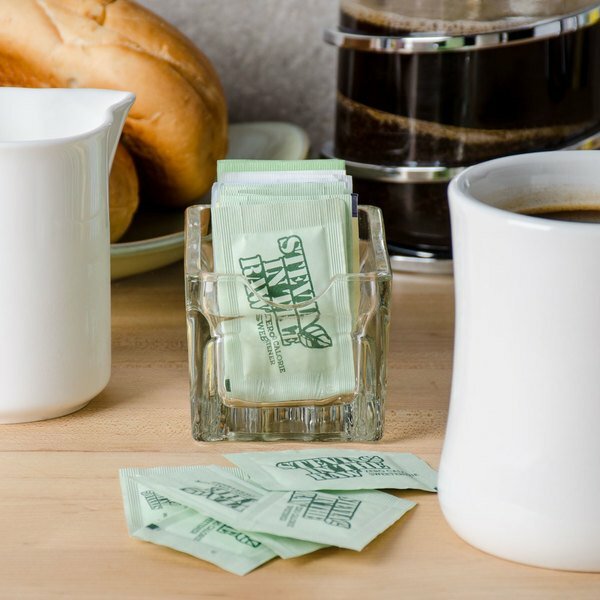 Stevia In The Raw makes a perfect addition to coffee shop counters and concession stands, and can also be served as part of your hotel's in room coffee service. Never again ordering from other companies and their over priced break room items. I even feel Webstaurant gives you more sugar b/c this has lasted us more than 2 months! This is probably the best sweetener on the market. Zero calories and it adds a very good sweetness to coffee or teas or really anything you want to add it to. Stevia is one of the more expensive sweeteners. If you want to impress someone or are serving higher end products I would go with stevia. That is what they would want and ask for. These are affordable and are of great quality. We set them on the tables for our guest for hot tea and coffee. They love them! 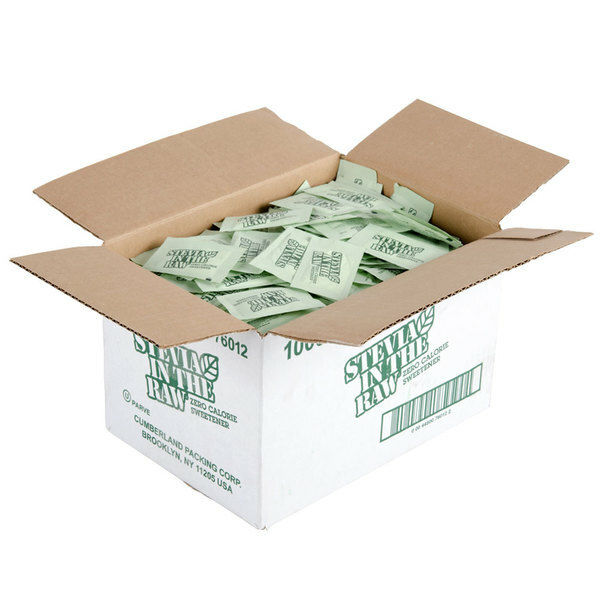 These single use Stevia packets are perfect for customers to grab on the go. It's even better that you get a large quantity for a low price! 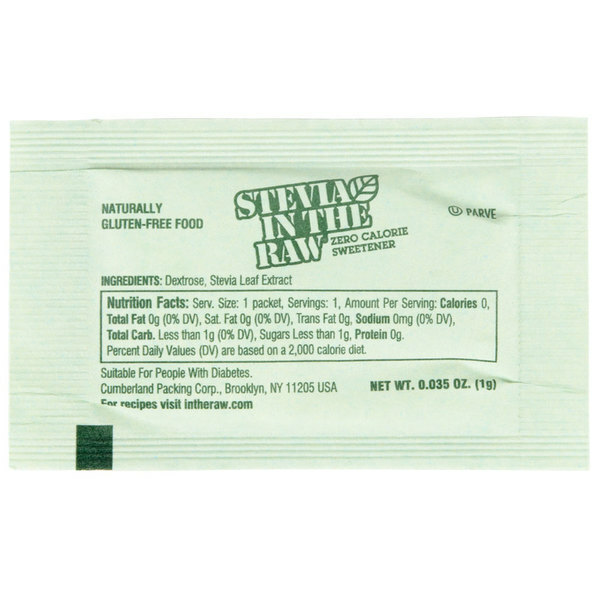 Very popular at our shop, the "in the raw" brand is trusted and a preferred sweetener! We will continue to get this though we are trying to reduce the number of artificial sweeteners to simplify our operation. good product. Price is reasonable. I prefer natural products if any and so I love to offer my customers a better choice. Very neat package. Stevia is the only sweetener I use and I love the stevia in the raw brand. This box lasts a very long time! Great price! Perfect for coffee or tea. Blends well. Is a big hit with people looking for stevia and loving the natural. One packet is enough for a small coffee or tea. We routinely order these Stevia packets. The individual size packets are so convenient for our cafe's customers. They arrive in good condition and the box lasts us several months. A great natural sweetener does what is says it does. We've shopped around and found webstaurant store to be the best value for this product. This is an excellent addition to our coffee shop; allowing people who want a plant based alternative sweetener to have an option for their coffee & tea. Stevia in the raw is getting more and popular these days! This product is great value and proves very popular with our customers so I recommend! Excellent product, just what we needed. The boxes are smaller than you think which makes for easy storage. Good product, recognized brand, customers like it. I am a stevia user, I prefer stevia all natural (RAW) over splenda, or any other sugar substitute. No chemicals in this day and age is very important. Love ordering this in bulk! Saving a lot compared to grocery store prices! Amazing how long a box will last us. Always packaged well and delivered timely. Customers love these, great having a healthy alternative to white sugar. Stevia is really popular right now so we were getting a lot of requests and people are always pleasantly surprised that we're carrying these. Great taste. Good product at a great price. This is probably the most popular sugar substitute at our small town coffee shop, we got a lot of requests for it before we started carrying it. We were buying on Amazon or in superstores, but this price is much better. Arrived in good condition, as described!